A spotted salamander comes up for a quick breath of air in a vernal pool. Adult salamanders are land animals with lungs. They live year-round in the surrounding woods. When they return to vernal pools to breed in the spring, they stay under water but still need to breathe air. On a warm and rainy spring night about this time of year, the woods come alive with salamanders on the move. Most of us aren't out there to see them, but spotted salamanders (Ambystoma maculatum) and others come up from underground burrows where they've spent the winter and head toward vernal pools to breed. It's often a mass migration in the dark. The adults, with their distinctive yellow or orange spots, return to the same vernal pools where they hatched. Most New Englanders are familiar with vernal pools, even if they don't realize it. Vernal pools are those small landlocked ponds in the woods that are full of water in late winter and spring but dry up and disappear by the end of summer in most years. We might not give them much thought, but vernal pools are very special environments. Their disappearing act is what makes vernal pools so special. Because the water doesn't last year-round, fish can't live in them. Without hungry fish, vernal pools make fairly safe places for certain salamanders and frogs to breed. In Westborough you can see vernal pools along trails at the Headwaters Conservation Area (such as the Malley Trail from the Mill Pond boat ramp to Andrews Street), the Bowman Conservation Area, and the Mass Wildlife Management Area. And those vernal pools aren't the only ones. Some Westborough residents have vernal pools in the woods behind their homes. We have 80 potential vernal pools in town. Students in the Wheaton College Vernal Pool Research Team used aerial photographs to identify these potential vernal pools. They worked under the guidance of their biology professor, Westborough resident Scott Shumway. Vernal pools are such unique environments for some wildlife – including certain salamanders and frogs – that they are protected by environmental regulations, including the Wetlands Protection Act. A key step is to "certify" a vernal pool with the Massachusetts Natural Heritage and Endangered Species Program (NHESP). The certification process involves collecting certain evidence and submitting photographs and maps to the NHESP. So far, fewer than a third of the vernal pools in Westborough have been certified. The Wheaton College Vernal Pool Research Team has certified just over 20 vernal pools in town. This spring the students are also continuing their research on the vernal pools at the Bowman Conservation Area. Spotted salamanders are the most common of the salamanders that depend on the temporary environments of vernal pools for breeding. The adult salamanders are actually land animals. They spend their lives in the forest surrounding vernal pools. Some make their homes as far away as 1,000 feet – farther than the length of three football fields. Spotted salamanders are active at night, so they are hard to see in the woods. They often live in underground tunnels made by other animals, such as small mouse-like shrews. You can sometimes find them under logs. They are larger than we usually think of salamanders as being. Adults grow to 6 to 8 inches in length – half a foot or more. They eat such creatures as insects, worms, and spiders, often lying in wait for them in a tunnel entrance. Spotted salamanders are also surprisingly long-lived. They can live 18 years or more. During their lifetimes, they return many times to breed in the very same vernal pool where they hatched. 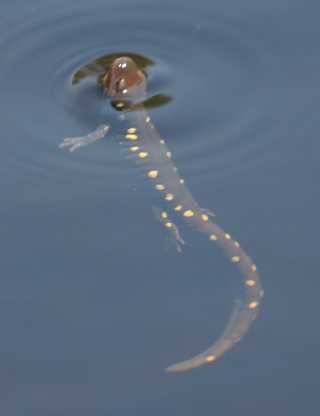 Only a small percentage of salamanders switch to a different pool. How do they know where to go? Their homing ability may be based on their sense of smell. It takes them back, often along the same route each time. How do they know when to go? Their cue may be a combination of rain and temperature. On a rainy spring night, when for the first time it's warmer at the surface than it is deep underground, the spotted salamanders set out. In our area, this cue usually comes in March, and the migration starts. Males usually arrive first, followed by the females. The salamanders swim around one another in a swirling mating dance. Males deposit packets of sperm in the pool, and females take up the packet deposited by the male of their choice. Later the females deposit fertilized eggs in masses that are often the size of baseballs. Eggs start to hatch in May. Young salamanders have legs and gills, but they take on adult form and use their lungs in time to leave the water in mid-summer when the pools start to dry up. Although the salamanders aren't easy to see, you can find signs of them by spotting the egg masses. They're usually attached to twigs or stems a few inches underwater. The eggs are surrounded by jelly that can be clear, milky, or even green. (The green comes from algae growing in the egg masses. The algae actually benefits the developing salamanders by providing extra oxygen). Egg masses from spotted salamanders and certain other amphibians are one kind of key evidence that's used in certifying a vernal pool. Of course, a photo of an egg mass from just any frog or salamander won't do. It has to be an egg mass from an animal that serves as a "vernal pool indicator" because it needs a vernal pool for breeding. Besides spotted salamanders, these animals include wood frogs (Rana sylvatica); two Massachusetts "species of special concern" – blue-spotted salamanders (Ambystoma laterale) and Jefferson salamanders (Ambystoma jeffersonianum); and two species deemed "threatened" in Massachusetts – marbled salamanders (Ambystoma opacum) and spadefoot toads (Scaphiopus holbrookii holbrookii). When you're out in the woods this spring, on the Charm Bracelet or other trails in town or behind your house, look for some of Westborough's vernal pools. The loud daytime croaking of wood frogs, which sounds more like quacking, is often a clue.